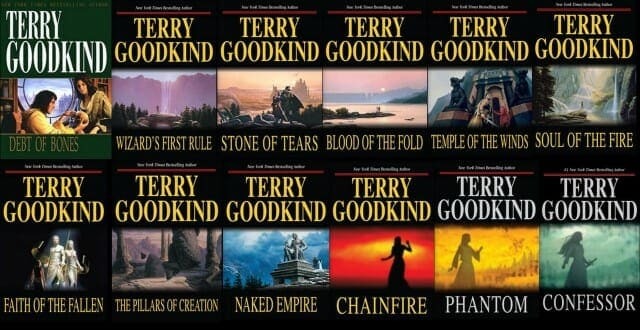 Blood of the Fold Audiobook is the third audiobook in Terry Goodkind’s epic fantasy series The Sword of Truth Audiobooks. Prior to the start of Blood of the Fold Audiobook, Richard comes to terms with his true identity as a War Wizard (a powerful wizard with both additive and subtractive magic). The New World, and all the freedom of humankind, is under threat from the Imperial Order after he had brought down the barrier between the Old and New World. The Imperial Order has already sent delegations and armies into the New World. Richard’s only option to stop the invasion is to claim his heritage and unite all free kingdoms and provinces under one rule and one command. Richard begins to bring the Midlands under his control by expressing his with me or against me policy. One group of people who have come to hear Richard at the Confessor’s Palace is the Blood of the Fold. The Blood of the Fold is group of men who are devoted to the Creator and to eradicating magic which they claim comes from the Keeper. Because Richard has magic, the leader of the Fold decides that he needs to stop Richard and comes up with two plans to accomplish it. One try to have him seduced by a woman assassin, and two kidnap his bride-to-be. Richard almost falls for the woman but at the last minute a mriswith attacks her to protect Richard. Because the mriswith protected Richard, he no longer looks at the creatures the same way, but later he finds out what a foolish mistake that was. Meanwhile, with Kahlan, Richard’s fiancee, the Blood of the Fold attacks her group and takes her to the Palace of the Prophets where the Fold is going to meet with Jagang, the Emperor of the Old World. In the last few chapters of Blood of the Fold Audiobook, Richard after discovering revealing information about travel, leaves the city to go save Kahlan but he just hopes that he has not waited to long.